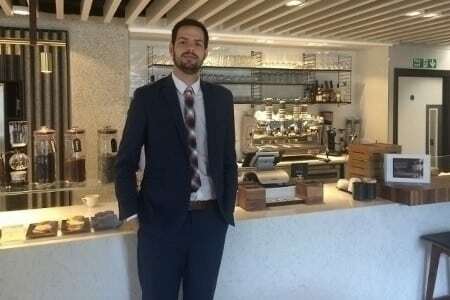 We chatted to resident coffee enthusiast Tomas Varo at QEII’s Sanctuary about his love and passion for the beautiful bean. He has driven his passion into us, and we are proud to be able to offer the best coffee in the relaxed environment of the Sanctuary – guaranteed to keep everyone awake and alert! When did you first discover your passion for coffee? I think I was 18 years old: when I was at university and had to pay for my own cup of coffee! I started a job as a dishwasher and I noticed the barista was making really nice coffees. So after closing time, I would normally stay behind and start experimenting with the coffee machine. One day, the barista was sick and everyone was worried, so I offered to give it a try. It turns out I was really good at it, so 2 months later when the barista left his position I was given a promotion and offered the role, which was great. Over the years, I worked in several different coffee shops in order to gain more knowledge and try new methods. Eventually, my friends and I started a small collective and were the first in Hungary to create gastronomic coffees. At the QEII we have a very interesting coffee maker in the Sanctuary, can you tell us more about it? That’s a Siphon which was invented, if I remember correctly, in 1830 – so it’s almost 200 years old. It’s basically a vacuum coffee maker that uses vapour and vacuum power to brew excellent coffee. You place the coarse ground coffee at the top, water at the bottom and place the burner underneath the water. The water will go up and start brewing the coffee for 3-4 minutes, and after removing the burner, the coffee is ready to be served. It’s a different method to what we normally use but it has a different flavour and also contains a lot more caffeine than a double espresso. It’s good to try new things – so if you’re a regular espresso drinker, you should definitely try a cup of coffee from the Siphon. Have you got a favourite blend or favourite beans? I like 100% Bolivian Arabica, which is a premium quality bean that tastes of apricot, tangerine, orange, lemon, to which you can add a caramel or dark chocolate flavour with the roasting. It has a really nice fruity taste, and depending on how you roast it, you can add a caramelised or dark chocolate taste so in the end you will have a very nice flavoured cup of coffee with bright acidity. It’s just amazing! But if we’re talking about high end premium quality, then the Kopi Luwak would be my dream cup of coffee (for those of you not in the know, genuine Indonesian Kopi Luwak is collected from the droppings of a wild, cat-like animal called the Luwak). The best thing about the coffee is the taste as it’s neither too sour, nor bitter. It is really mild and it tastes like heaven! However, it’s pretty costly – if you ordered an espresso of that coffee it would cost you £30-40 for just a cup. But it should be tried at least once in a lifetime. Finally as a coffee enthusiast, describe your perfect cup of coffee and where would be your dream location to drink it? It would have to be near the sea, obviously, but actually I am planning to go to Colombia to a coffee plantation where I can select the beans of my choice, process them, grind them and make the perfect cup of coffee. That’s my dream. We have learned quite a lot about coffee from Tomas, especially how not just any coffee will do to rev you up for a busy day of meetings! We currently have a special offer at the Sanctuary; 20% off your first drink, between 5.00pm and 6.00pm (Monday to Friday*). So please pass by and enjoy our selection of different snacks and beverages.